Humberside is entitled to 9 seats. In East Yorkshire, my plan is less radical than the Commission’s: I keep Hedon in a Beverley & Holderness seat, for example. Hull is combined with the old Haltemprice town council area. Goole is a very rural seat and includes all of Axholme. “South Humberside” is really north Lincolnshire, and one day it’d be nice if the area was moved back into the East Midlands region. That would make constituency-building a lot easier. In my plan, instead of splitting Cleethorpes, I’ve split Grimsby. This is partly to avoid splitting a ward – if you split a ward you can create seats more like the current ones. Email the Commission with your views. It all comes down to how they decide to handle towns like Grimsby. Splitting it “cracks” the Labour vote while the commission’s proposals “pack” it. Suffice to say that I expect the Conservatives to support cracking and Labour to support packing. The same principle applies to Scunthorpe and Lincoln – all towns are surrounded by solid Tory rural areas but all towns small enough to maintain and difficult to justify splitting due to natural local leanings. Logic in the Grimsby case (and knowledge of what it’s like on the ground) overwhelming supports adding wards from Cleethorpes over splitting the town in half. Interesting but can you not keep the Haltemprice wards together? 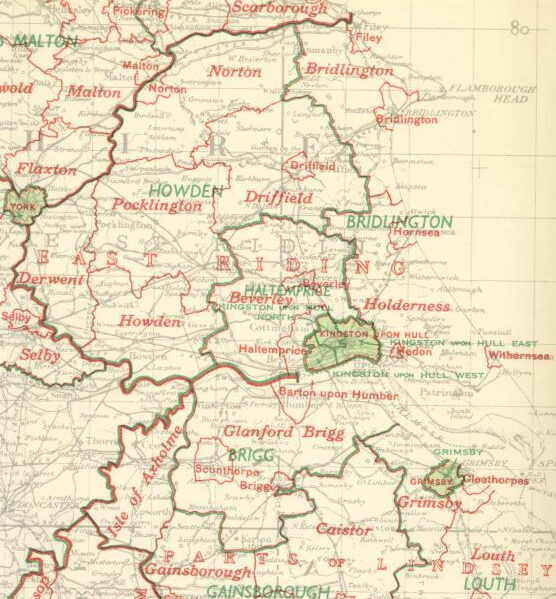 As you can see from the 1955 map Haltemprice is everything from Cottingham to Hessle. As for Grimsby, I’d go for splitting Grimsby rather than splitting Cleethorpes – better to split a big town, where local ties from one side to the other are weaker, than a small town which is likely to be more united. So I agree with you not Gareth. That may be the case in some areas but believe me, there is nothing uniting the two wards of Cleethorpes proposed to join Grimsby and the one ward that would go into Brigg and Humberston. Thye are physically separated by a major road and the demographics couldn’t be more different. The southern ward considers itself part of the Lincolnshire wolds whereas the other two consider themselves to be an extension of Grimsby. I’ve never met anyone who lived in the Cleethorpes ward of Haverstoe who would say they have a stonger affinity with the rest of Cleethorpes over Humberston, ditto I’ve never met anyone from Sidney Sussex are of Cleethorpes who would relate to Haverstoe over the centre of Grimsby. If you wandered around the border you’d have to look at a map to tell whether you’re in Grimsby or Cleethorpes in some areas as there’s absolutely no distinction between them on the ground. 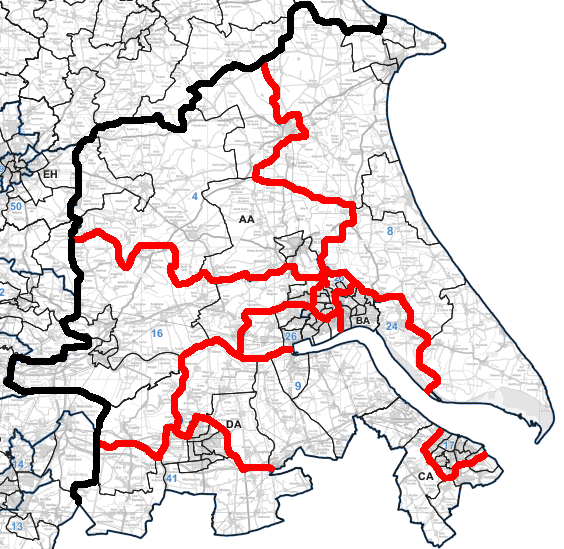 More importantly to the idea of splitting Grimsby, it simply doesn’t work on current ward boundaries – the division is entirely false anbd would be extremely confusing to residents. The town is one that looks entirely to the centre and nobody would recognise any kind of divide across the town (the nearest you’d get to a division would create a doughnut). Even if northern Lincolnshire had been considered as a part of the East Midlands it would be exceedingly difficult for anyone with on the ground knowledge to argue against splitting Cleethorpes as proposed. My instinct is the usual “Great Grimsby” solution favoured by Gareth, the Commission and Austin Mitchell. Having said that, having an “All the leftover bits that aren’t Grimsby or the centre of Cleethorpes” seat is never going to be brilliant. My plan splits Grimsby in order to avoid splitting the Croft Baker ward.